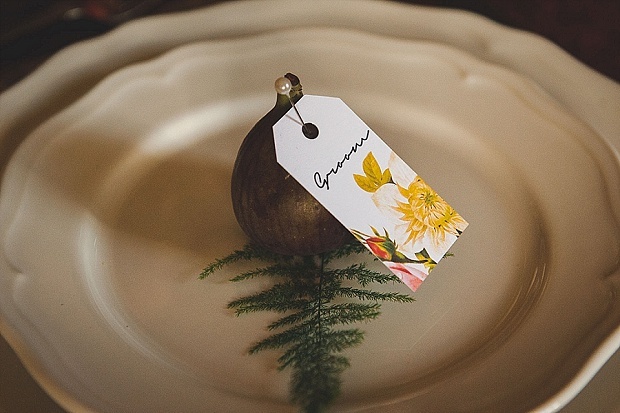 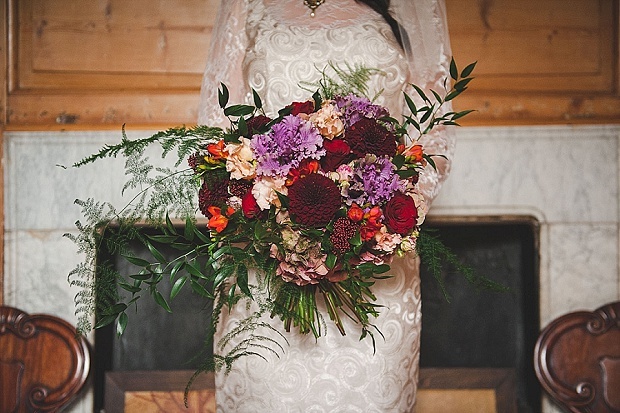 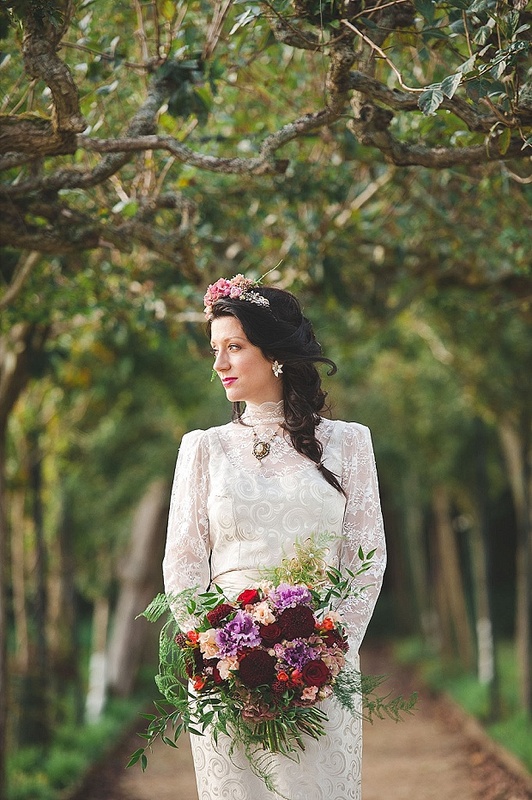 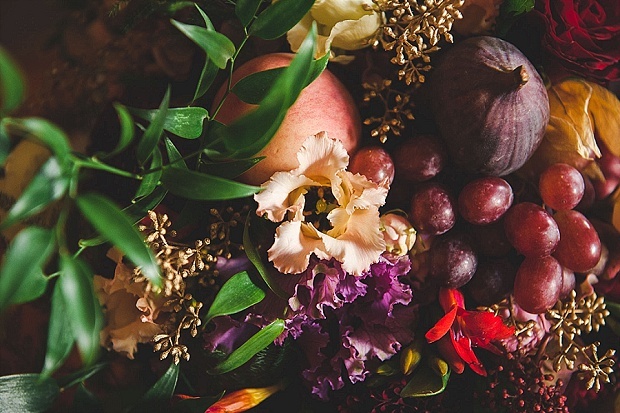 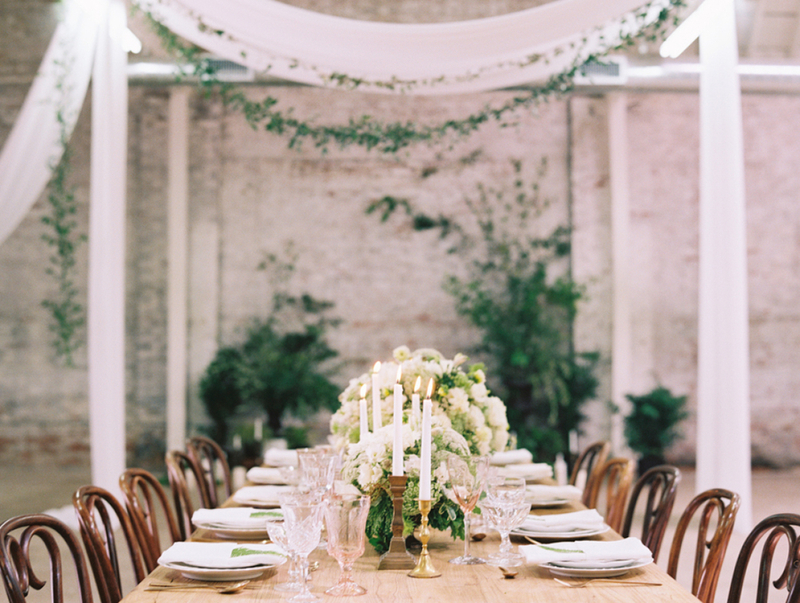 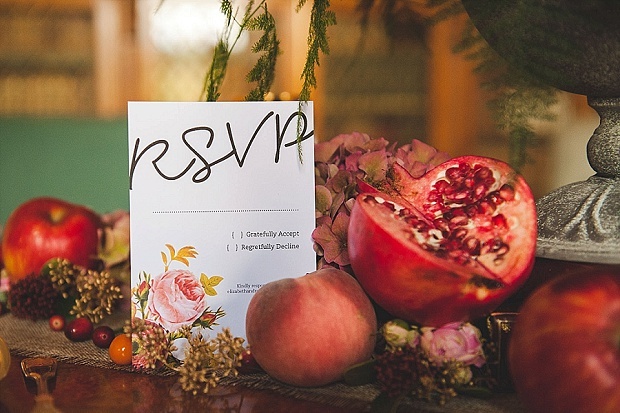 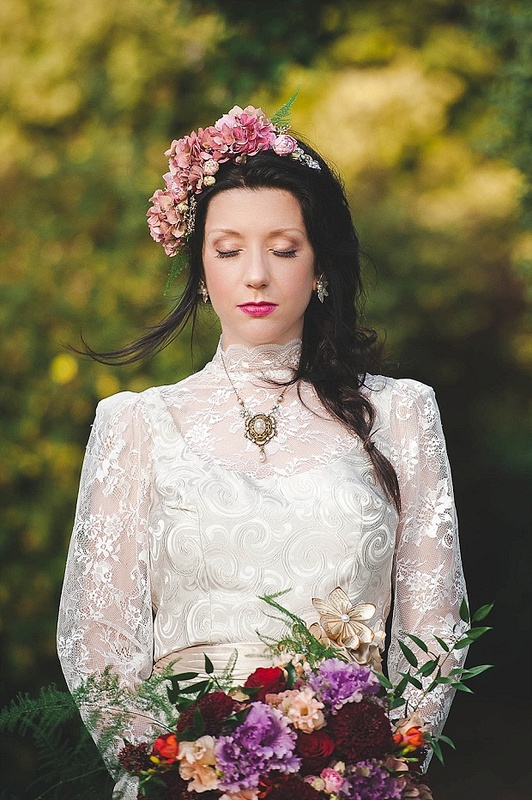 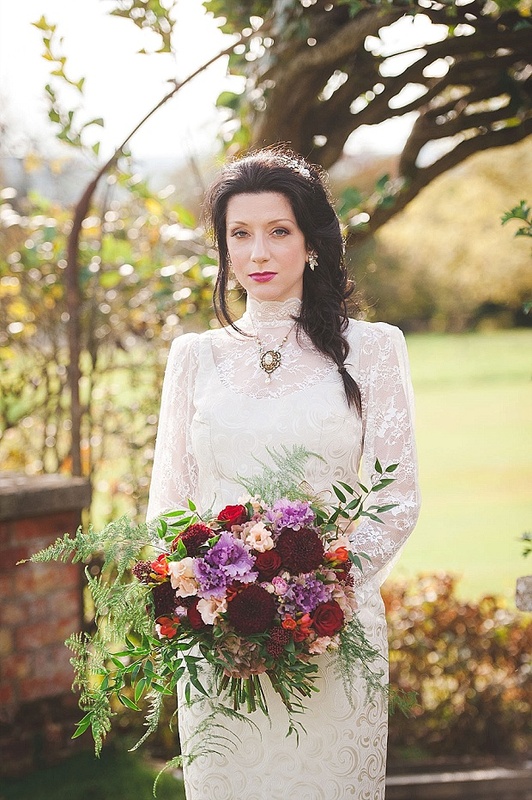 Today’s wedding inspiration is a beautiful and quirky styled shoot. 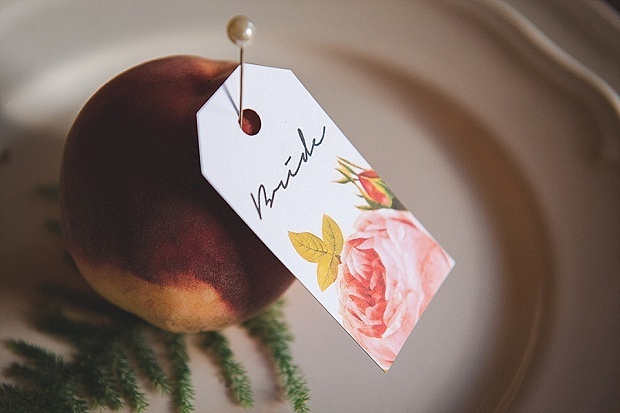 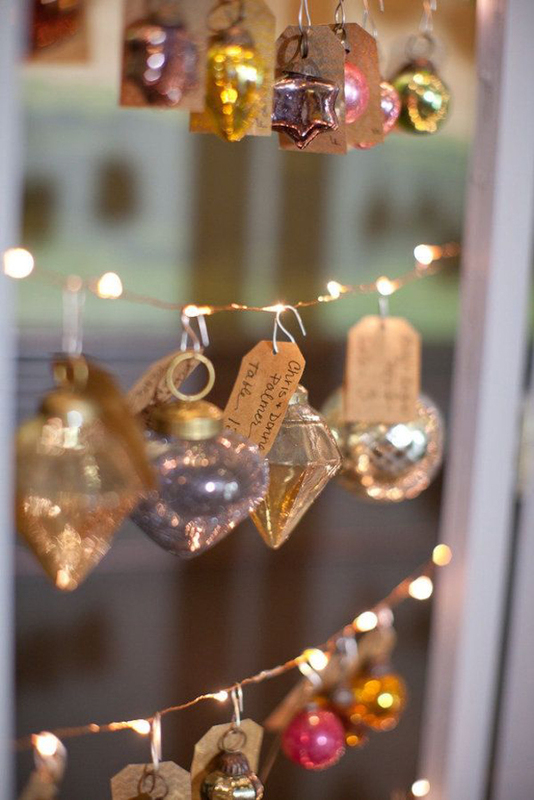 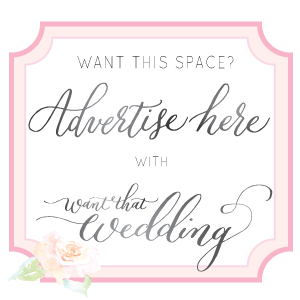 I love sharing these on the blog as the suppliers involved are always really talented creatives showcasing some of their more quirky wedding ideas or beautiful and fun fashion trends – not yet reflected in every day weddings. 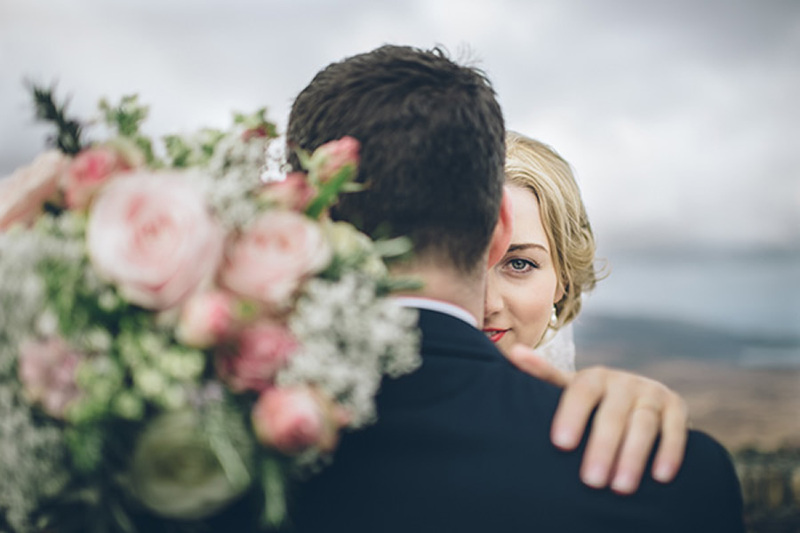 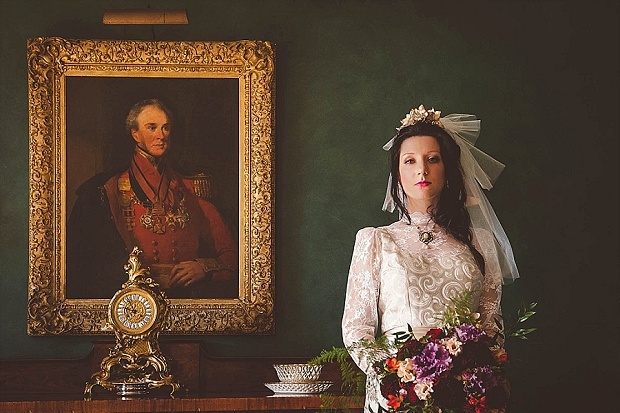 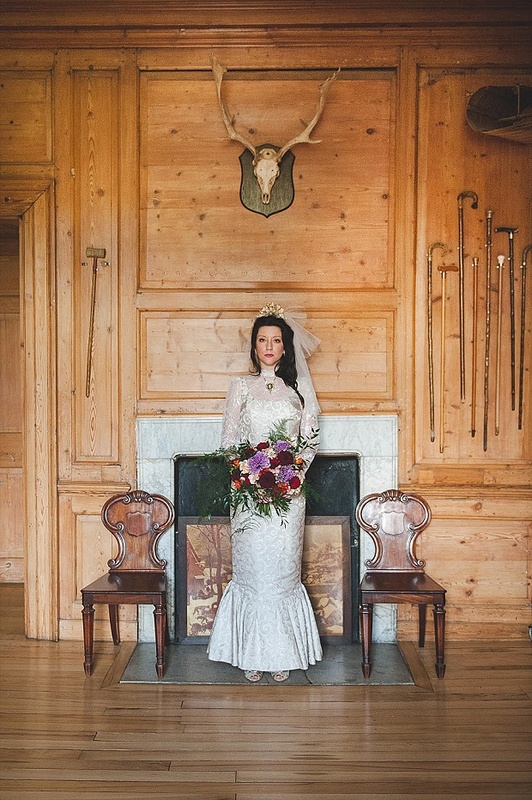 Brides and grooms to be can take much inspiration from these shoots, and this gorgeous literary, Victorian inspired wedding shoot is certainly no exception. 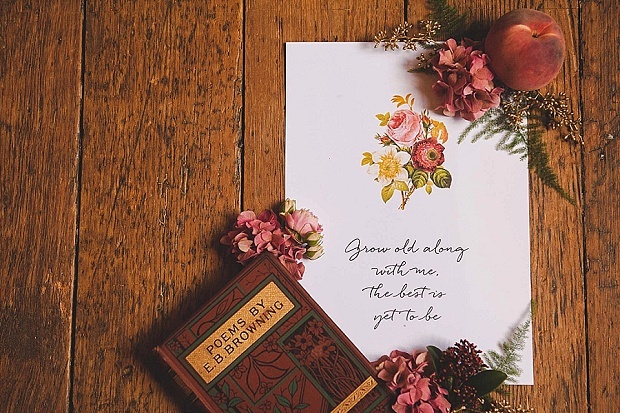 Words by Gwenda Wilkes. 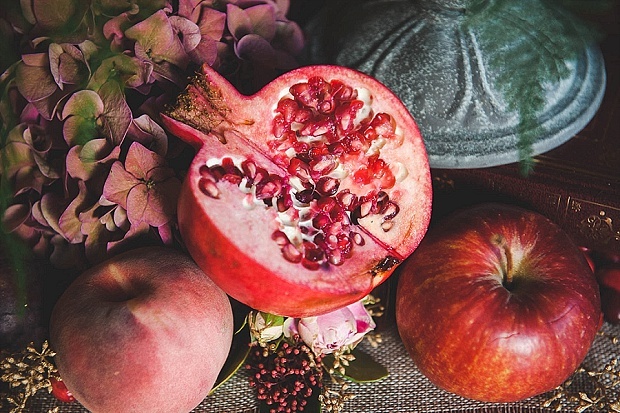 Images by Heline Bekker. 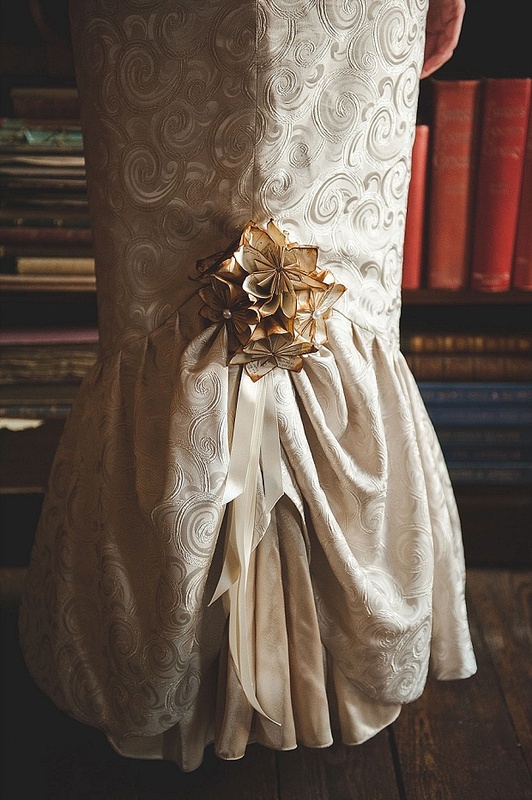 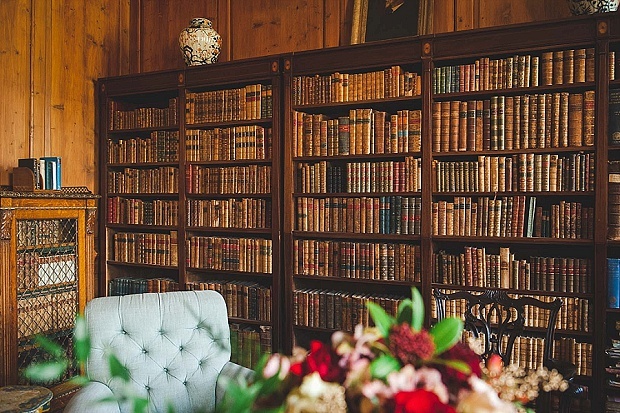 I’ve always had a soft spot for old books and literary themes are popular amongst my brides (many of which are English teachers and Librarians!). 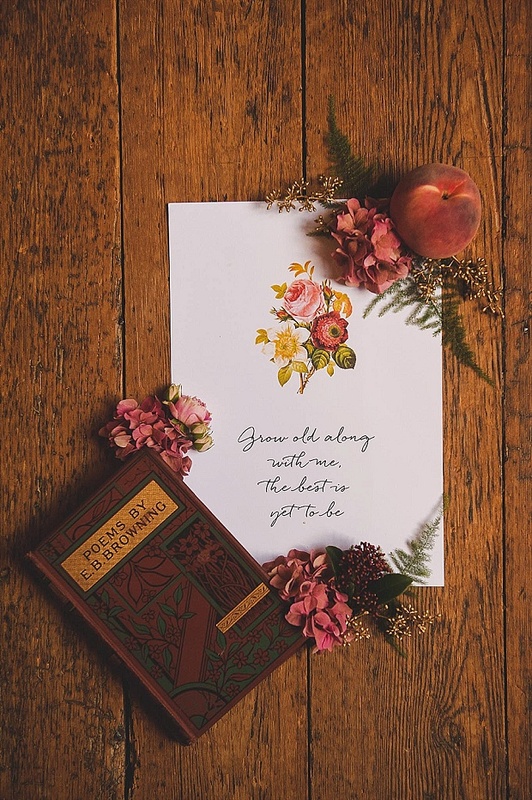 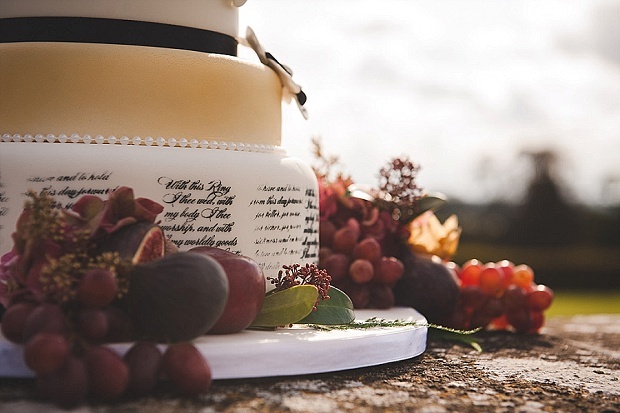 Inspired by the wedding-perfect quotations of Elizabeth Barrett Browning, the concept developed into a Victorian-with-a-twist theme, with a jewel-like colour scheme of reds, purples, deep greens and just a touch of peach. 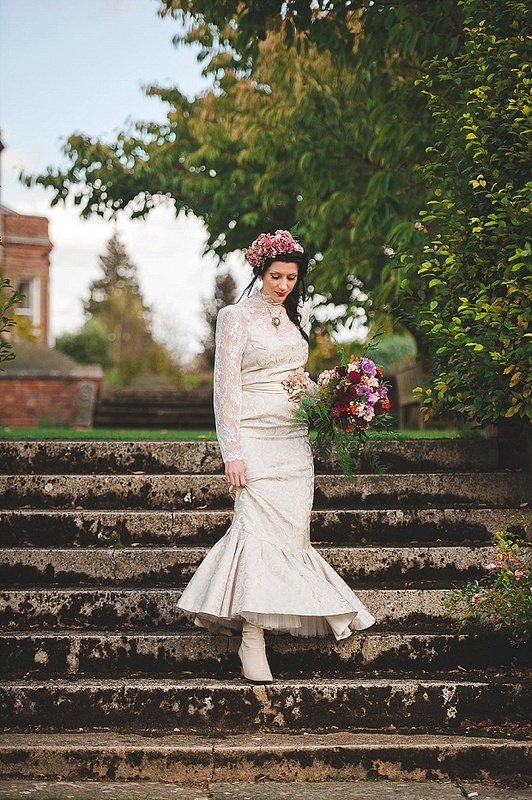 To fashion a modern take on a Victorian bridal look, Lauren created a fishtail plait using heated curlers for volume and hair extensions to give the impression of longer and fuller hair. 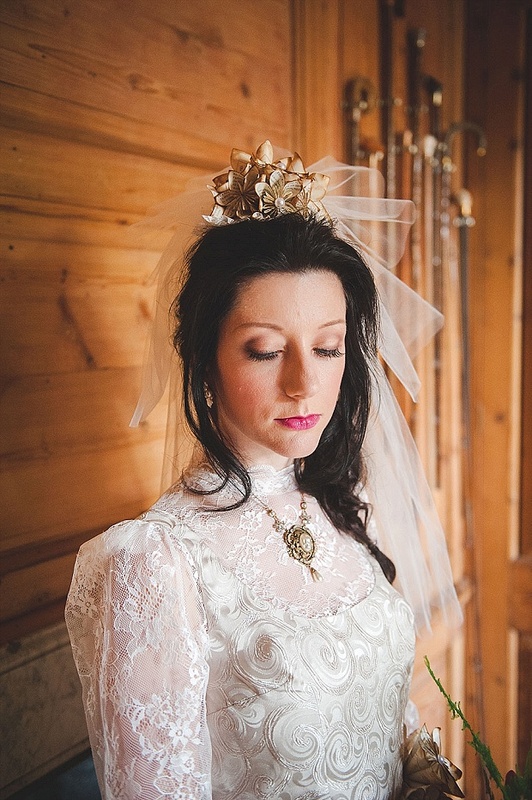 Mel wanted to keep the makeup relatively current but with some elements of the period. 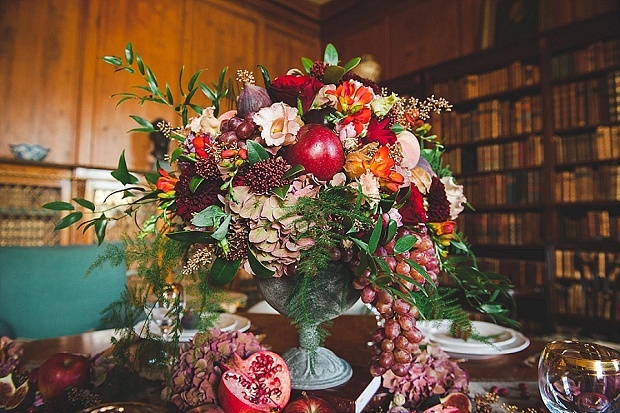 Women were being recognised for their achievements and it showed with the onset of bolder accents of colour to their beauty regime. 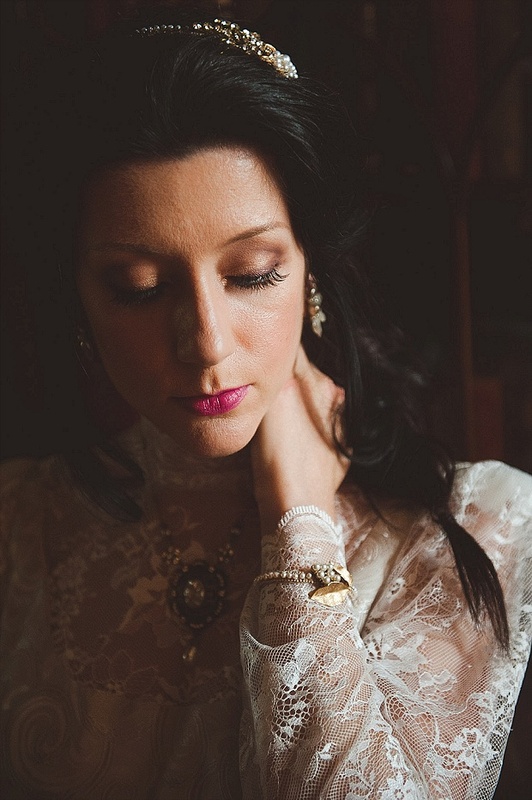 Stronger lips and brows were popular, so she kept the palette soft but rich, using the Dior 5 colour shadow palette (limited Edition 046) in Golden Reflections, creating a soft, golden smoke which really suits brunettes. 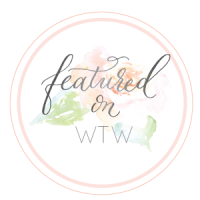 She then used a MAC berry tone on the lips called Dark Side, which carries though into Spring and Summer if matched with soft, pastel shades. 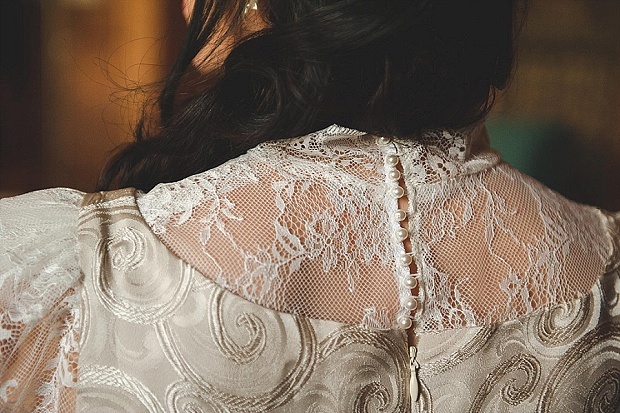 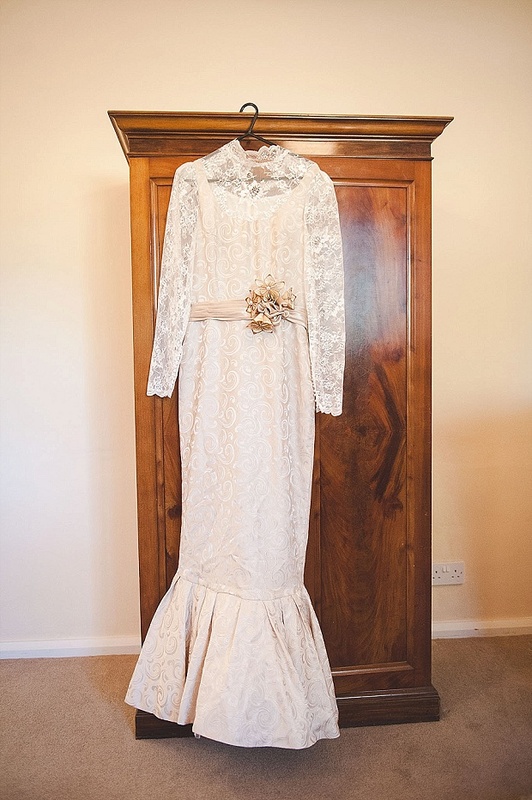 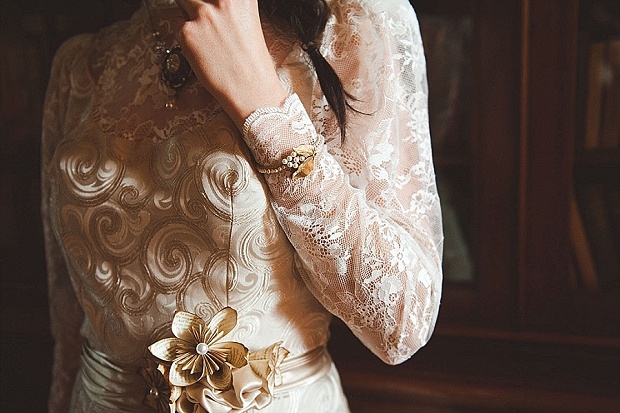 Karen’s golden dress, with a high lace neckline and long buttoned sleeves, was made to mirror the strong victorian women who surfaced at this time. 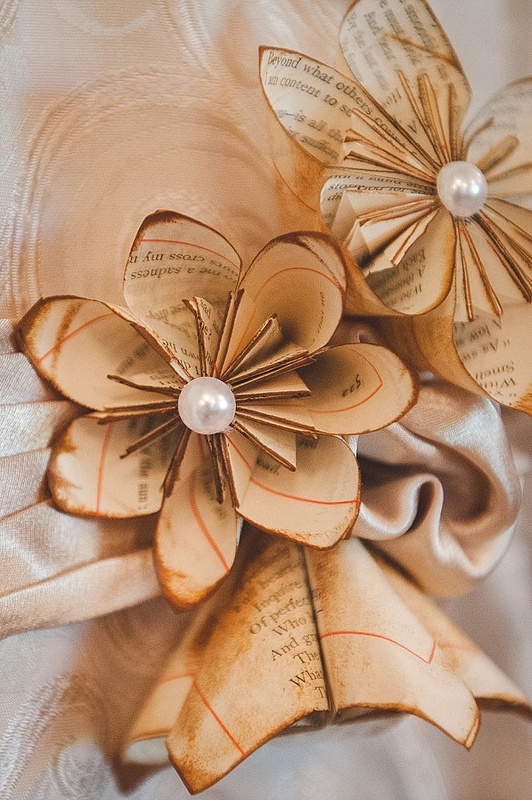 She found local craftsperson Karleigh, who made paper flowers from aged Elizabeth Barrett Browning poetry sheets. 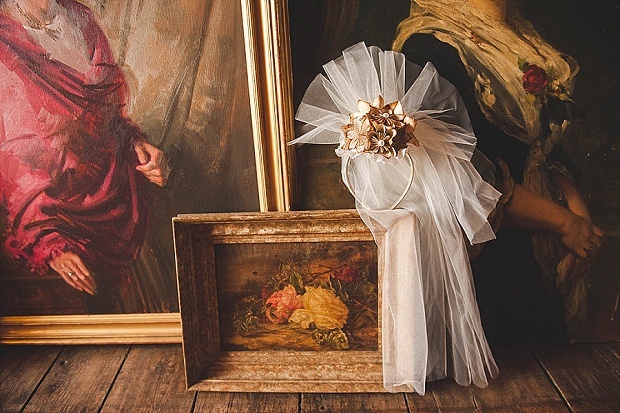 These she attached to the dress and the headpiece; the latter included a plume of ivory veiling to enhance the beautifully made flowers. 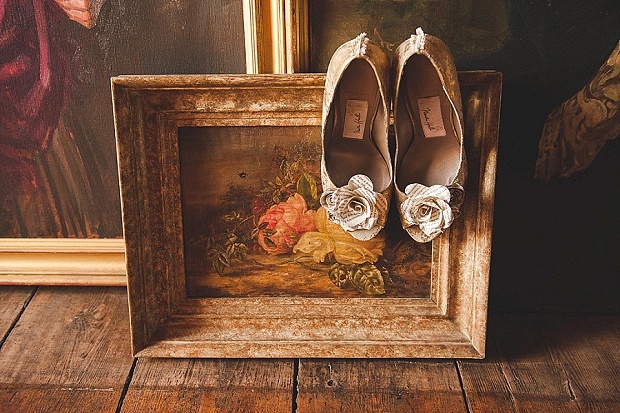 For the shoes, Marsha took her inspiration from old books. 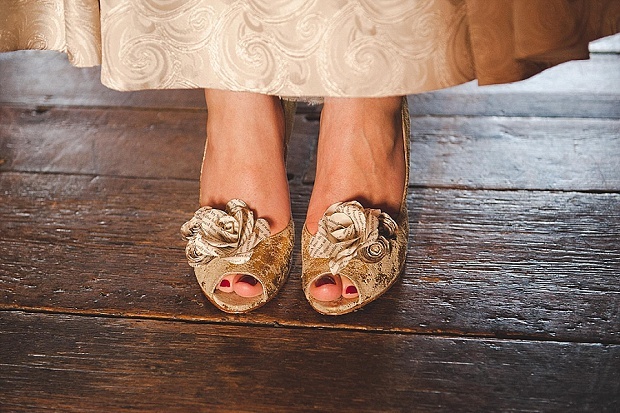 She used a distressed gold leather for the elegant peep toe design to represent the gold edges of the pages. 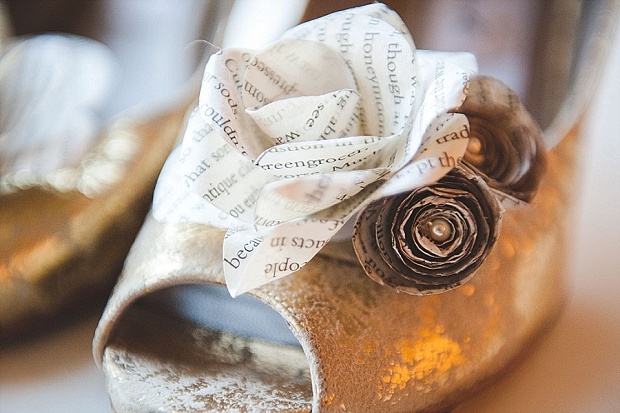 Real book pages were used to create paper roses to adorn the front of the shoes, with a shimmery bronze dusting on the edges, complete with small pearls in the centre to symbolise pearls of wisdom. 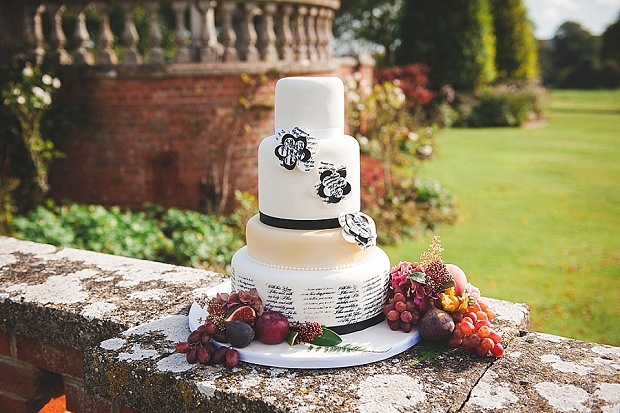 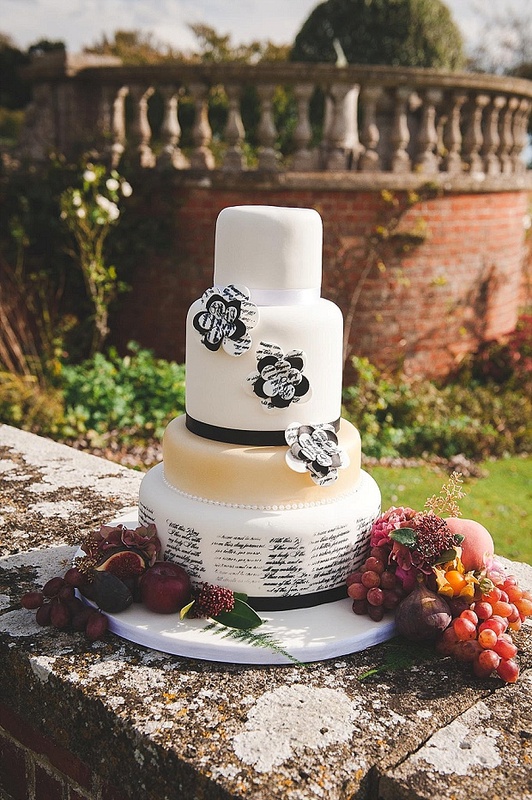 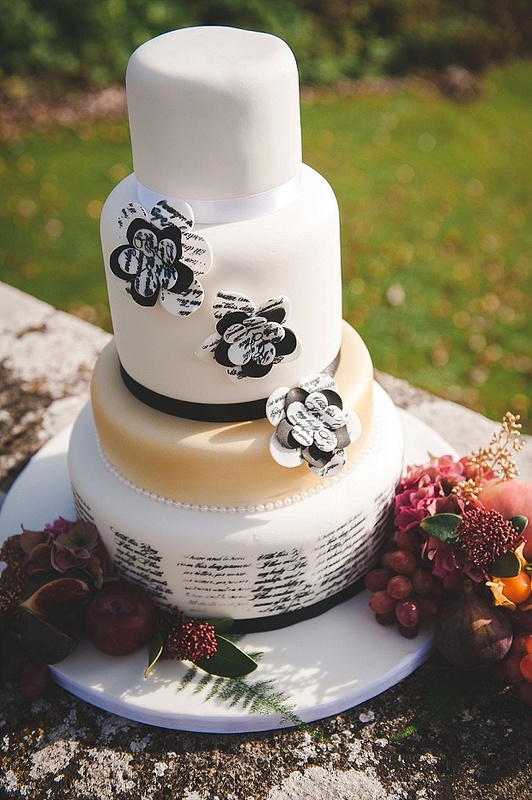 Lucie’s cakes also picked up on the textual theme and the recurrent rose motif and the gilded aspect, perfectly fusing the prevailing elements of the shoot in a refined design. 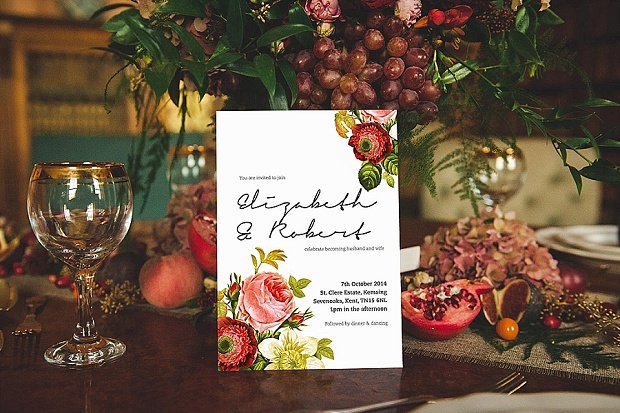 Sarah’s stationery featured brightly coloured vintage blooms, styled around a romantic and handwritten font which compliments the style of the Victorian era. 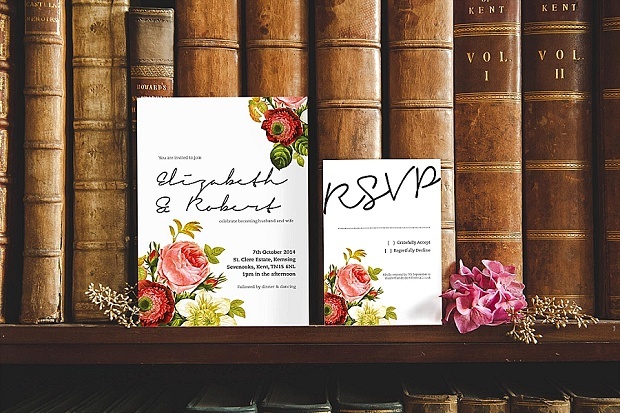 A subtle texture in the off-white card gives a luxurious and tactile feel to the invitation, rsvp and place names. 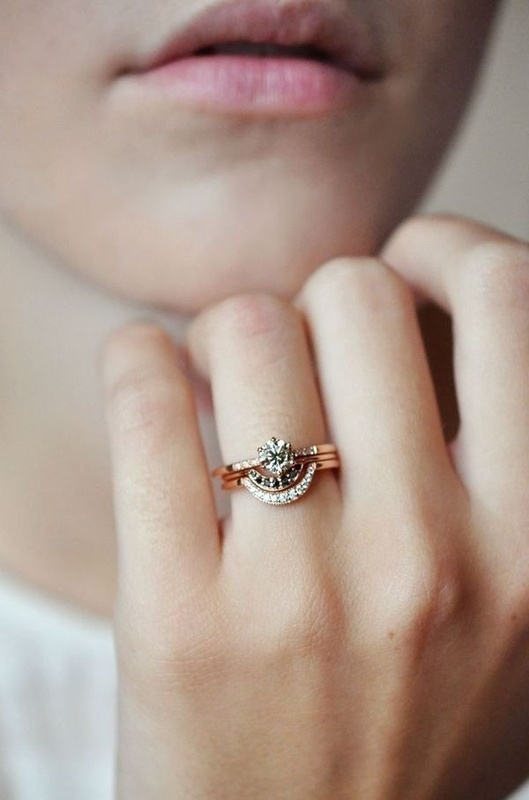 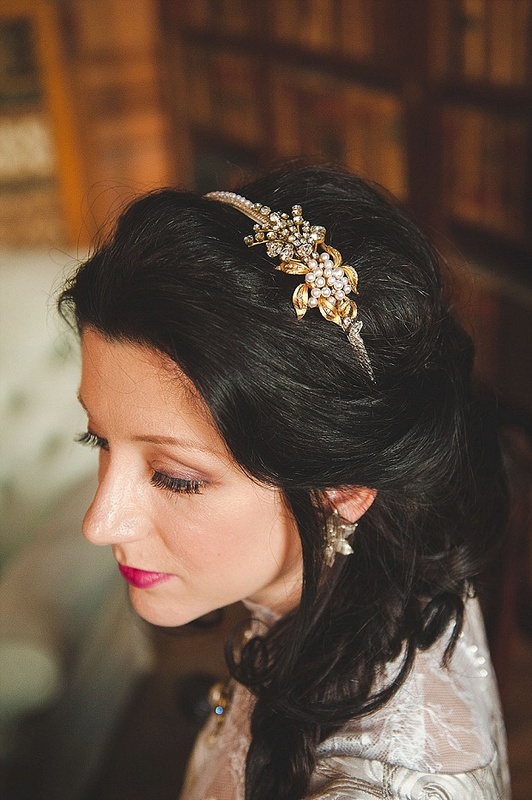 Caroline’s jewellery is beautifully crafted from antique and vintage treasures. 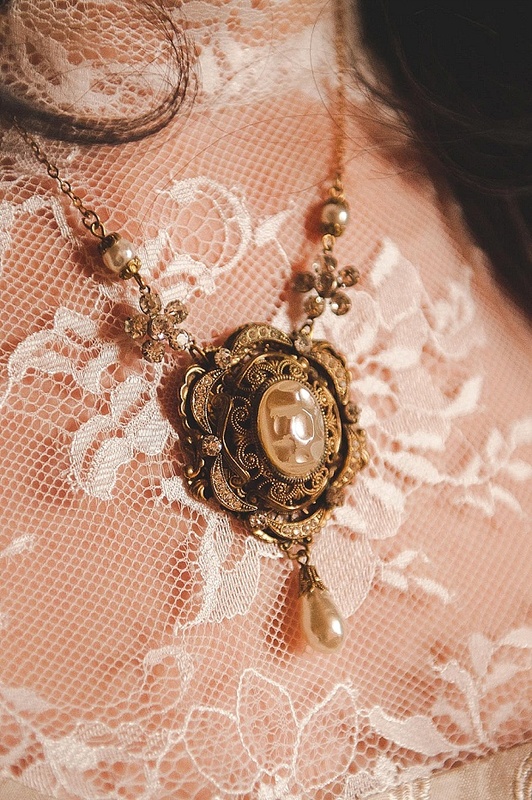 Each piece is like a small work of art, with it’s own unique patina of age that evokes a deep sense of nostalgia of times gone by; a time when pieces of jewellery, like leather bound books, were kept and treasured throughout a lifetime and then passed onto to someone dear, who might appreciate them anew. 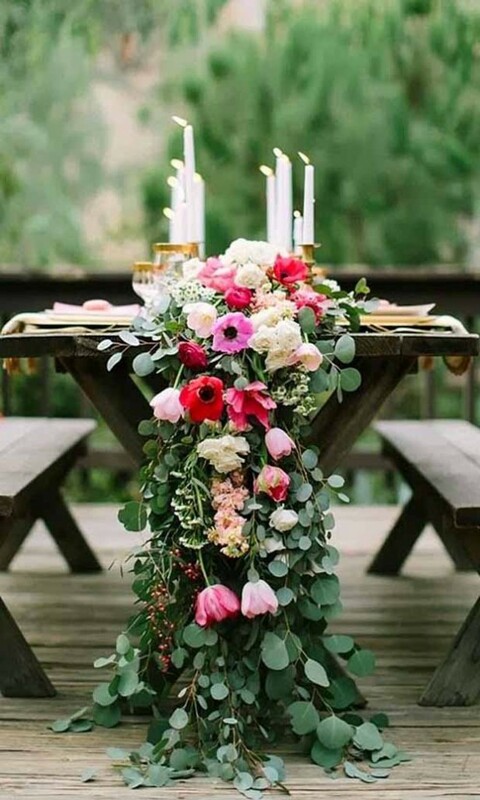 I was thrilled when I used hydrangeas, dahlias, freesias, brassica, lisianthus, roses (both standard and spray), skimmia, asparagus fern and soft ruscus, to create informally-structured, slightly wild-looking arrangements. 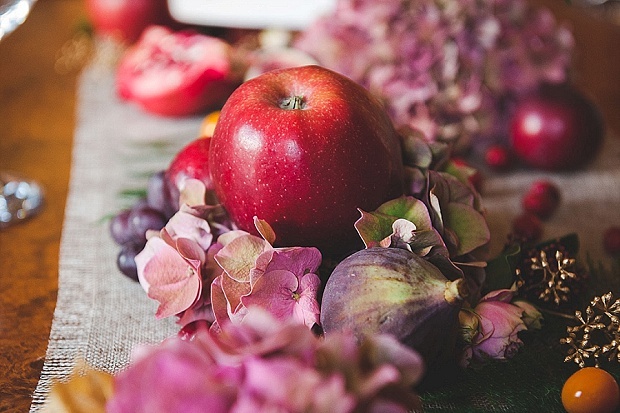 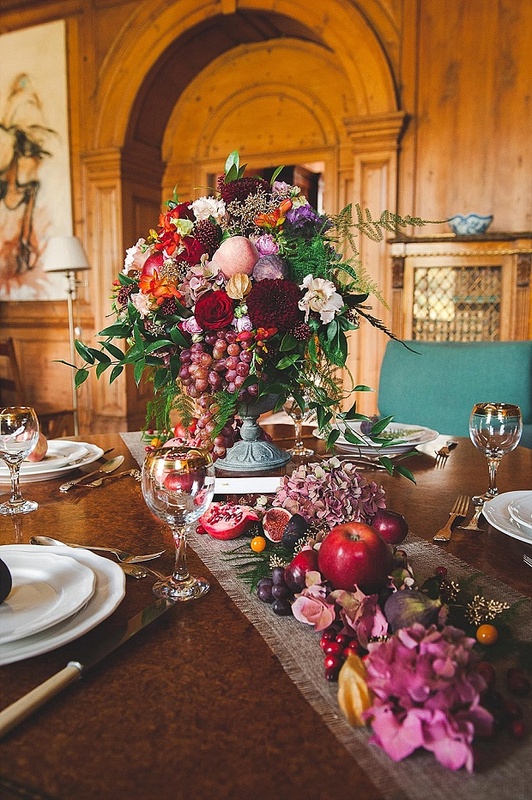 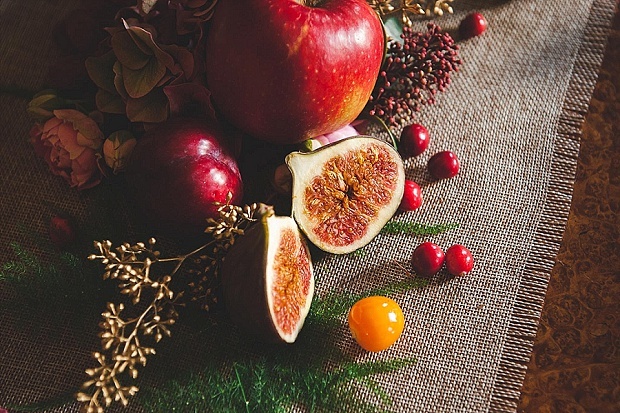 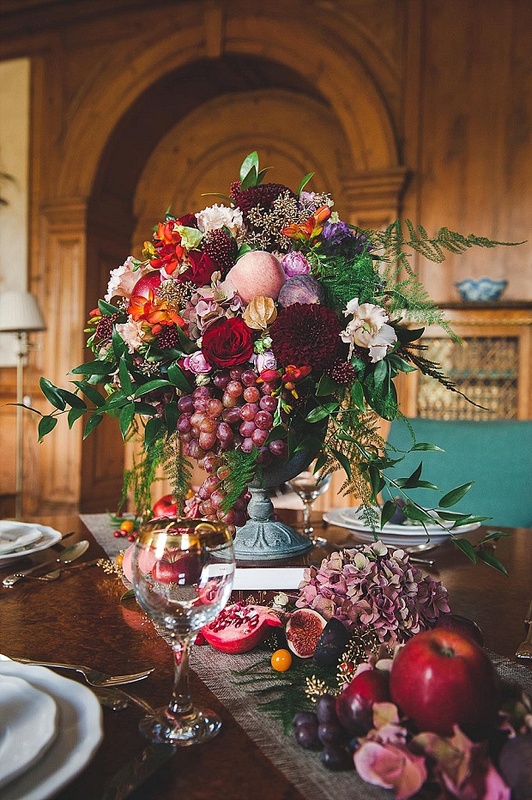 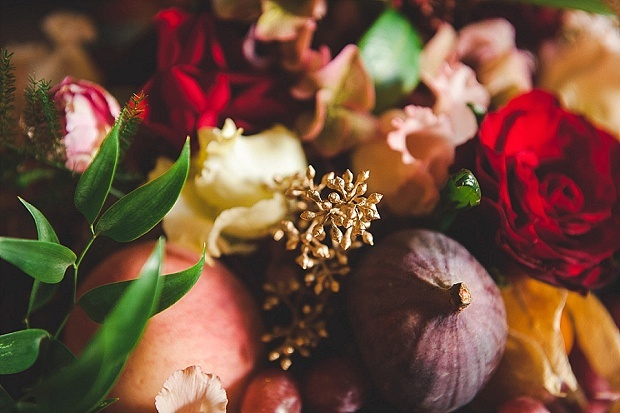 On the table, I added pomegranates, figs, apples, plums, physalis and cranberries for a decadent touch, perfectly suited to our opulently bedecked bride! 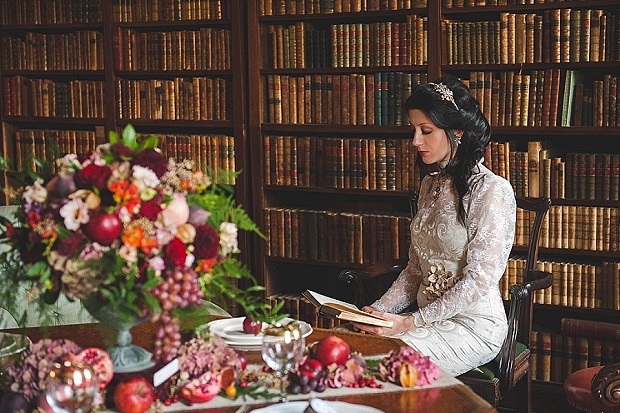 Thanks so much to the fab team for sharing this literary inspired shoot with WTW. 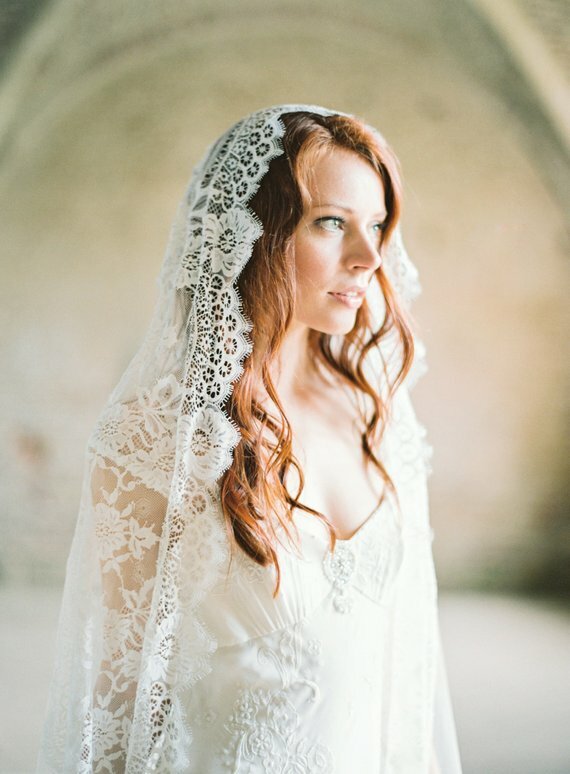 I hope all you lovely brides to be are feeling super inspired.